Mandatory Continuing Education for PA and NJ real estate license can be dull. But… Chip Hughes of A.R. Hughes & Co (www.arhughes.com) did an excellent job of holding and interesting class on Cycle Analysis for the continuing education class in November 2013. I would like to share one of the significant points Chip made by tracking the prevailing thought, in other words the herd, and where they are placing their money. One way to recognize the prevailing trend of thought was to compare the percentage recovery of the various commercial real estate product types in Value from the Peak to the Trough before the 2007 – 2008 financial crisis and through to today. The percentages were based on National statistics. It was obvious that for the category “Apartment – Major” the loss in Value was about 23.1 % and the percentage gain from Trough through today is 100%. The Moody’s summary Chip had referenced 20 different sectors of property types. 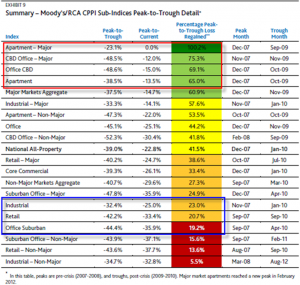 For example there were Apartment, Apartment (65% recovered), Non-Major (percentage recovered 53.5%). The prevailing trend still appears to be favoritism for Multi- family and “Central Business District Office – Major” (75.3%). The recovery for Suburban Office as a type has only been 19.2%. This product type could be an excellent place to invest dollars before the prevailing trends shifts in that property types favor. Of course when you drill down to specific Cities and specific Suburbs the local economies will have different world cycles.